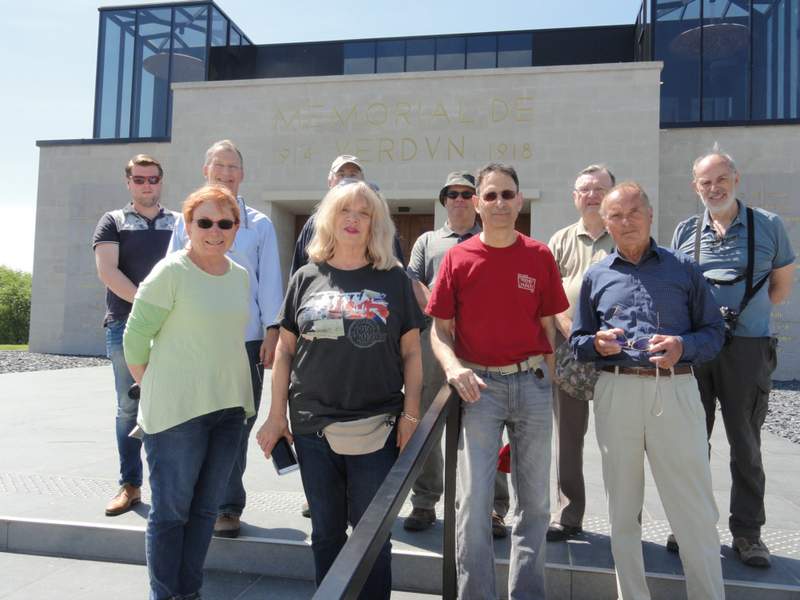 In May, on behalf of Valor Tours, I led a Centennial Tour of the Verdun Battlefield. The group members have been sending me photos for over a month here are some I thought the readers of Roads might enjoy. 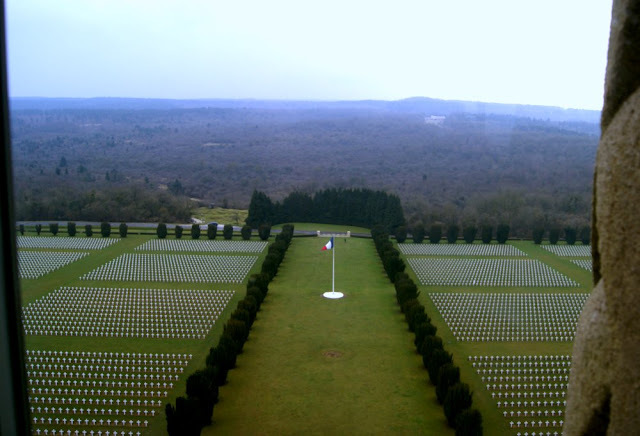 We drove the entire length of the famous road from Bar-le-Duc to the Verdun train station. Sassoon and his regiment, the Royal Welch Fusiliers, arrived on the Somme in early 1916 and were assigned to trenches running through a small wood south of Fricourt village named Bois Français. The German trench opposite was labelled the Kiel Trench on maps. His unit took casualties from the start, a friend, Lt. Thomas, was killed. 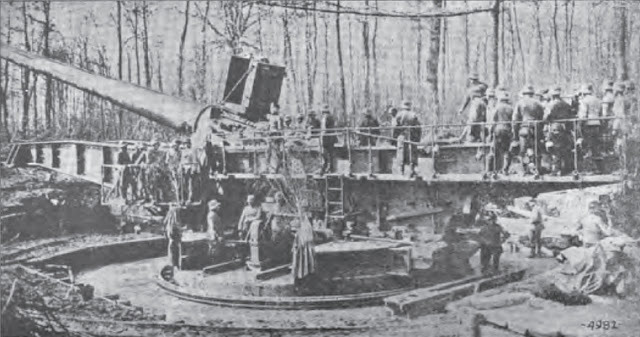 A major raid on the Kiel Trench was planned for 25 May. 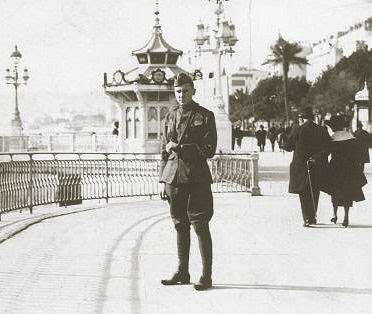 Sassoon wanted to lead it, but, having just returned from a school assignment, he saw the command the 37-man mission given to another officer, Lt. Stansfield. Sassoon was in command of an evacuating party that lay out some 20 yards beyond the British trenches and whose job was to cover the return of the raiders. The raid was a failure. While trying to negotiate the German barbed wire, the alarm was raised and the British party became involved in a bombing fight in which several of the raiders became casualties, in particular, the advance scout for the raid, Corporal O’Brien, who had previously served under Sassoon. Sassoon then went out into No Man's Land and met Lt. Stansfield, wounded but being assisted back to the British lines by two of the raiding party. 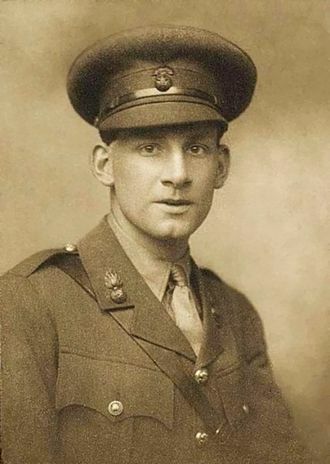 Sassoon then discovered that O’Brien was lying badly wounded at the bottom of a deep crater. After returning to the British trenches, he came back with some helpers and managed to get a rope round the wounded corporal, who, with the aid of a stretcher bearer and others, was brought to safety. O'Brien, however, later died. For this exploit Sassoon was awarded the Military Cross. The award was presented to Sassoon by the battalion Medical Officer, 100 years ago on this date, just two days before the battle of the Somme began. On 1 July, his unit was in reserve but would soon be sent into action for the assault on Mametz Wood. This history of the Battle of the Somme (1916) is an unusual book, one I'd recommend to any reader interested in the First World War. One reason it's unusual is that The Somme is almost entirely primary sources. The text consists largely of letters, journal entries, and notes taken by British soldiers. (*) The author however adds some light framing and contextualizing details after a short introduction, along with invisible editorial work, picking and arranging the texts into chronological order. 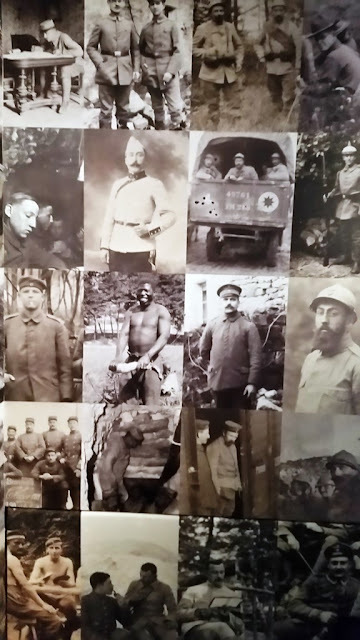 The book also includes a great deal of photographs taken by those soldiers, usually in violation of regulations. We see exhausted soldiers, trenches, tools, dugouts, ruined landscapes, captured weapons, barrage balloons, the terrifying new tank, wounded men walking or being carried — it's a very rich visual record. I don't think I've seen any of these photos before. Taken together, van Emden gives us a fresh take on this enormously famous (and notorious) battle. We follow the action on the ground, largely bereft of grand strategy and lacking foreshadowing. Soldiers focus on their immediate environment, unsurprisingly, giving us a micro-level view of the large battle (really an offensive). This makes the fighting much more accessible, humanizing a topic that can turn quite technical or abstract. 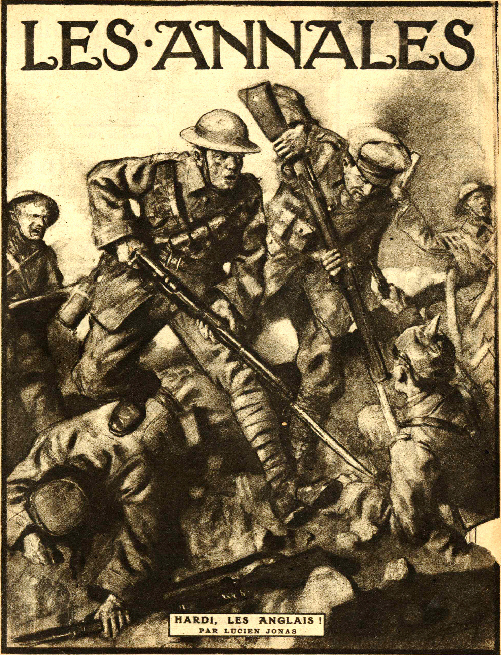 For example, the first 100 pages and two chapters occur before the attack, showing soldiers settling into new positions, new recruits (like the Pals Battalions) getting used to being in the line, and the offensive in preparation. The reader gets to settle in as well, learning the front. Elsewhere we read letters written by one Raymond Asquith, a son of the then-current prime minister. We read about him from his fellow soldiers, then learn of his death. Later we see H.H. Asquith visit the front, yet we do not see his reaction to the loss of Raymond. Instead we must process his death ourselves, through his letters, and by means of fellow soldiers' reactions. I felt tired suddenly. The few yards home were miles. The world was full of stretchers and white faces, and fools who gibbered about the great advance (130). From the open door of our goods van, we were able to realize more than ever before the magnitude and fury of the struggle of the previous autumn. In every direction, as far as the horizon, stretched a desert of brown shell-ploughed slopes and hollows, and scattered upon the face of this landscape, clumps of splintered poles, gaunt and blackened by fire, marked the sites of former woods and copses...I, too, had not realized until now the degree and extent of its awful ruin. Life - human, animal, and vegetable - had been engulfed; not a leaf, hardly a blade of grass, no sound of bird, greeted us; all was done and finished with. Here indeed was the end of the world… (339-40). For a quarter of an hour our artillery rained shells on the corner of the wood that held the Germans, and on the enemy's supports. And our men jested among themselves. The tension was over: they were going to get their own back now: they had stormed a Boche stronghold before, and had come out "laughing": this might be a sterner job, but the Glasgows could do it if anyone could... (191). Beyond, aligned in ordered rows, battery by battery, stood a park of pigmy brethren. These were the 18-lb field-guns — of no great account, one might be tempted to think — but ask the army of von Arnhim! These were they whose flaming sleet thrashed down the massed counter-attacks of Germany; these were the barrage-makers!...Here lay a tangible proof of England's will, a token of what the folk at home had undertaken on our behalf (223). I can't think why Germany wanted war, to destroy homes, and to break hearts, maybe! I do not feel really unhappy, but in me glows a pride — I can feel it as I look at my mud-besprinkled khaki, high boots, and spurs — to think that I have the honour to bear arms against such people as the Germans (313). Physically, The Somme is a very well produced book. Pages are high quality, glossy and heavy, nicely rendering photographs. Supporting material is weak, unfortunately, with only two pages of maps and a paltry index. Readers would have benefitted from a glossary of terms or marginal notes to explain technical and local terms (does "Coy" = "company"?). However, I recommend the book for those interested in WWI, in personal narratives, and in early photography. (*) One exception to this British focus is a German soldier's diary in Chapter 6. One Lieutenant Kammich recorded his experiences under a tremendous British attack in the Thiepval pocket from later July into September. It makes for a nice change of perspective and pairs well with the chapter's British accounts (264, 266-277). On a personal note, combining texts from opposing sides was how I used to build my Literature of War class syllabus. For much of human history, men were stuck with facial hair. Beards were mandatory unless one wanted to pluck out the follicles. Once metallurgy has been refined in any civilization, however, the technology of knives and scissors follows soon after. These cutting tools become more and more refined, and these refinements lead to the development of the razor — the sharpest knife possible. With a very sharp knife, it became possible to begin shaving. Even with these developments, however, men preferred beards. This may be because shaving with a straight razor is a somewhat dangerous activity unless you lived in a city and were able to afford regular visits to the barber. And so, all the way up to the 20th century, beards were fashionable and most men wore them. But during World War I in the United States, that all changed thanks to a former traveling salesman and socialist manqué Utopian named King C. Gillette. He released his "safety razor" in 1901, and by 1917 it was steadily gaining popularity because of a massive ad campaign. His device made it possible and inexpensive for men to shave daily. 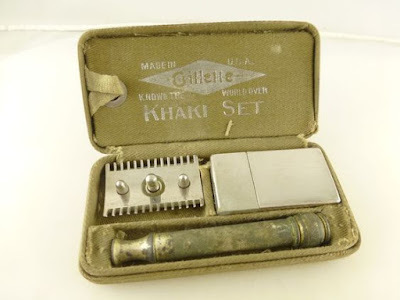 Better yet for razor manufacturers, soldiers in the expanding United States Army were required to shave. This was in good part a necessity due to the emerging dangers of chemical warfare. Soldiers had to use gas masks for the first time. In order for a gas mask to fit properly, you need to be clean shaven. For whatever his anti-capitalist tendencies, King Gillette was a marketing genius. For instance, he had instinctively known that his real moneymaker wasn't the razor but the blades that had to be regularly replaced. His concept of selling the razor — effectively just a mount and shaper for his blades and which never wore out — at highly discounted prices, while making his profit on the blades that needed to be regularly replaced, was the birth of the disposable, limited-lifespan culture. 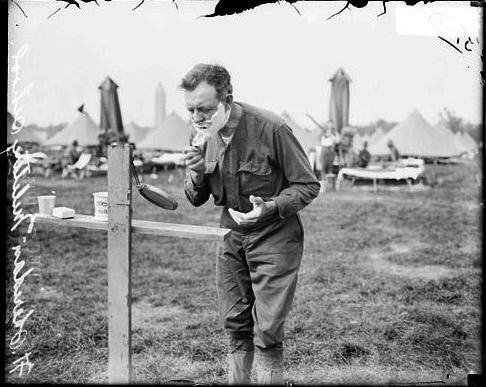 When war broke out Gillette jumped on the opportunity to expose his product to a shaving-obliged and captive market of millions of young Americans. He sold 4.8 million of his "Khaki" razor sets to the U.S. government at cost. His real bonanza came after hostilities ended and the Doughboys went back home. When all of the soldiers returned from WWI with their clean-shaven faces, they were heroes. They appeared in their home towns, and they also appeared in newsreels in the new movie theaters that had sprung up everywhere. 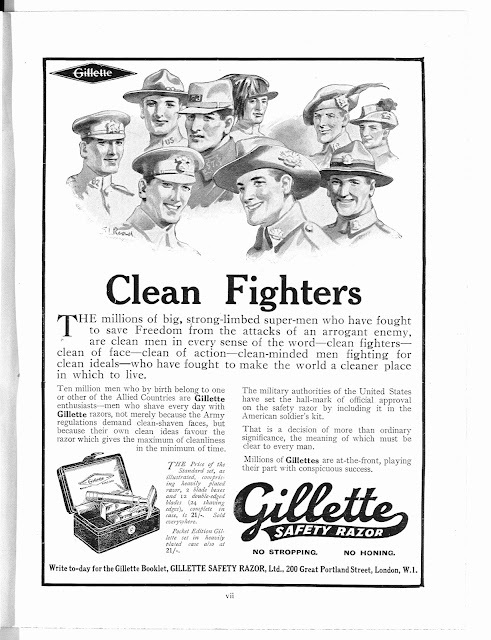 Combined with ad campaigns from companies like Gillette, it became the fashion to be clean shaven. Between 1920 and 1960, beards were definitely out of fashion, but, as we know, that trend moderated afterward. Father Duffy: Why Was He Beloved? 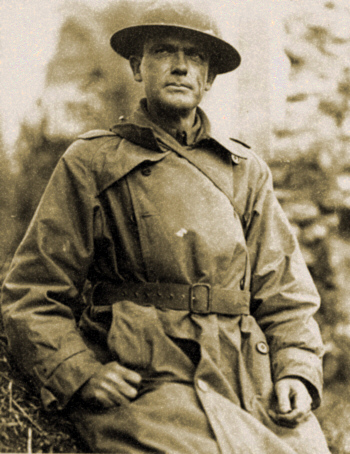 Father Francis Duffy was the chaplain of New York's 69th Infantry, which fought in France as the 165th Infantry, a component of the 42nd through his gentle humanity and courage under fire, first to the men and officers of the regiment and then back home in New York City when the troops returned home and his story became generally known. After his death he was honored with the monument in Times Square shown above. In his book, Duffy's War: Fr. 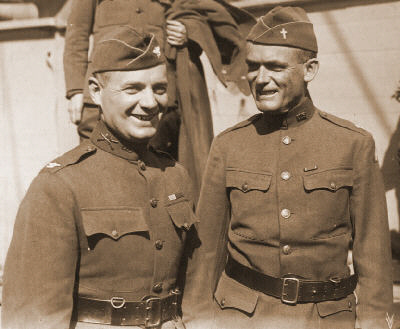 Francis Duffy, Wild Bill Donovan and the Irish Fighting 69th in World War (Potomac Books, Inc., 2006), author Stephen Harris gathered some of the best memories of those who knew Father Duffy. As you read these selections from Steve's book, concluding with some of Father Duffy's own words, you will understand why he earned the respect of everyone whose life he touched and why the values he embodied still matter to us today. [AT THE OPENING OF THE SECOND BATTLE OF THE MARNE,] realizing his place was at the front line comforting his men, Duffy stayed throughout the worst of the shelling and the harrowing hand-to-hand combat. Maj. Tom Reilley saw the chaplain constantly exposed to enemy fire as he tended the wounded and carried them on stretchers to the nearest dressing stations. ''His religion consisted of a cheery word, a smile, and a slap on the back,'' Reilley recalled. ''He made himself dear to many a doughboy by handing out cigarettes just at the right time." [AT THE BATTLE OF THE OURCQ A NEW YORK TIMES CORRESPONDENT] described Duffy as ''coat-less, covered with grime...in the thick of fighting, cheering on the living, administering the last rights...to the dying, filling the place of a stretcher bearer who had been struck down by a bullet...For 117 hours he was under fire without rest..." [ONE] of his sayings, according to the correspondent, was "Give 'em hell!" But while the battle raged on, the priest had been seen weeping. When the fight was at its worst, [MAJOR ALEXANDER] Anderson asked the chaplain if he wanted some grenades. The priest said, "No. Every man to his trade. I stick to mine." 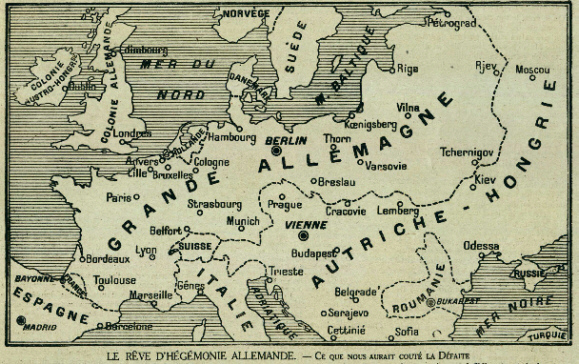 I forget where I came across this French propaganda map, but it's quite interesting. It's from early in the war, Turkey does not seem to have received any spoils of war, while Italy — still presumed part of the Triple Alliance — has received some of the territory it was yearning for. 1. Austria-Hungary gets Ireland and Moscow. Why would they want either of them? 3. France is left a bit of the Pyrenees to chew on, and the Romanovs get to keep a re-shaped Crimea. 5. I really wish the cartographer had shown the rest of Russia out to Siberia. Imagine the tottering Dual-Monarchy trying to manage the entire Asian land mass. 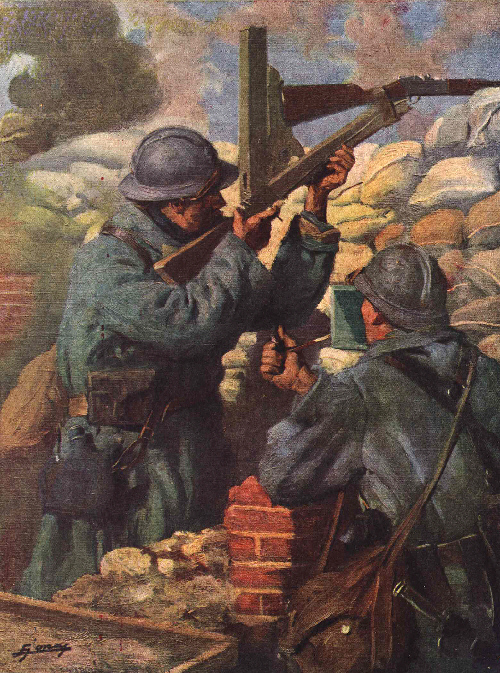 Lucien Jonas was one of the more prolific Great War illustrators. A gifted and talented artist, he was mobilized in December 1914 and in February 1915 was officially accredited as "military painter seconded to the Musée de l'Armée" in Paris. 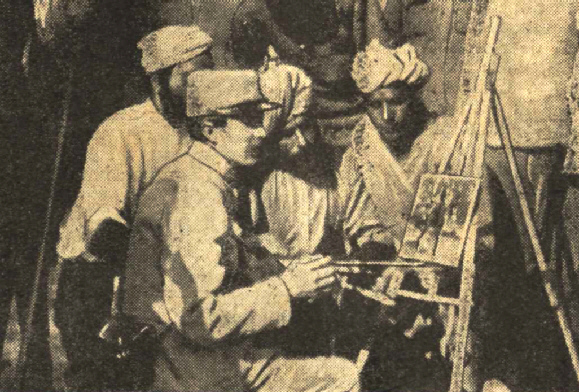 During the war he traveled extensively along all sections of the front lines and produced thousands of drawings, oil paintings, charcoals, sketches, and illustrations of all kinds. 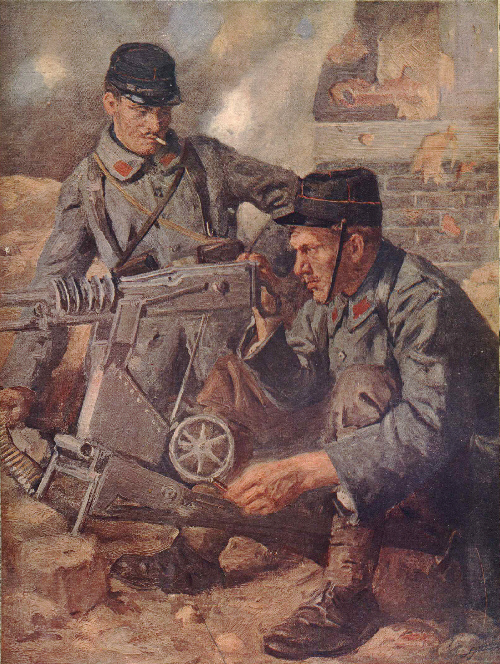 Perhaps of all wartime artists in France, Jonas was the most successful and well known. In any case, his production of artworks of all kinds — paintings, sketches, drawings, woodcuts, and such — was prolific in the extreme. His work was published in virtually all of the French and Allied media as well in those of the Central Powers, though these last countries no doubt censored some of his more patriotic illustrations. For, above all things, Jonas was a French patriot to the bone, full of pathos and a strong desire for revenge against the hated Teutonic invader and intertwined with a religiosity that was unusual for French artwork of that period. He also made great use of allegory in his work, some of his illustrations looking more like preparatory sketches for public statues. He was the creator of many series of illustrations that can often rightfully be described as propaganda for the French cause. His German officers look hateful and ungainly or arrogant, often sporting a monocle and mustache as well as showing an unholy delight in the wrongful suffering and depredations on the civilian population. These works were very influential in creating mental imagery of the Boche enemy, in inspiring patriotism out of outrage and a burning desire for revenge. But, in seeming contrast, Jonas was a vivid illustrator and portraitist of the common soldier of all Allied nations and of great generals and war leaders as well. 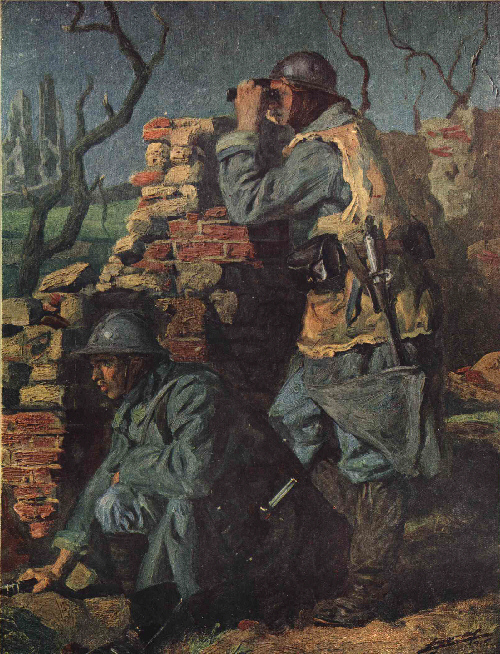 His work appeared in such varying weekly and monthly publications as L'Illustration, Les Annales, and La Guerre Documentée, this last being an artistically inspired publication pertaining to the war, published by Schwarz & Co. in Paris. 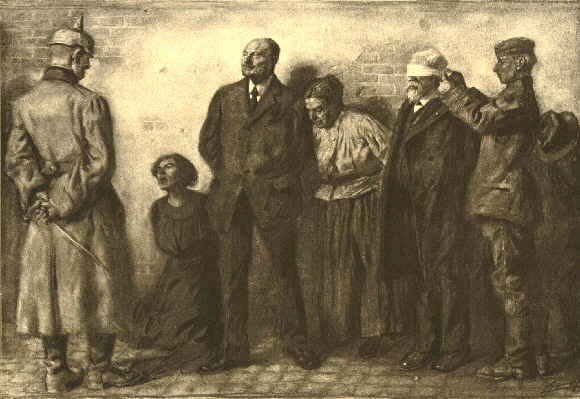 The same publishers also printed a five-volume collection of Jonas's wartime sketches as a limited and numbered edition immediately after the war, so much was he held in esteem. 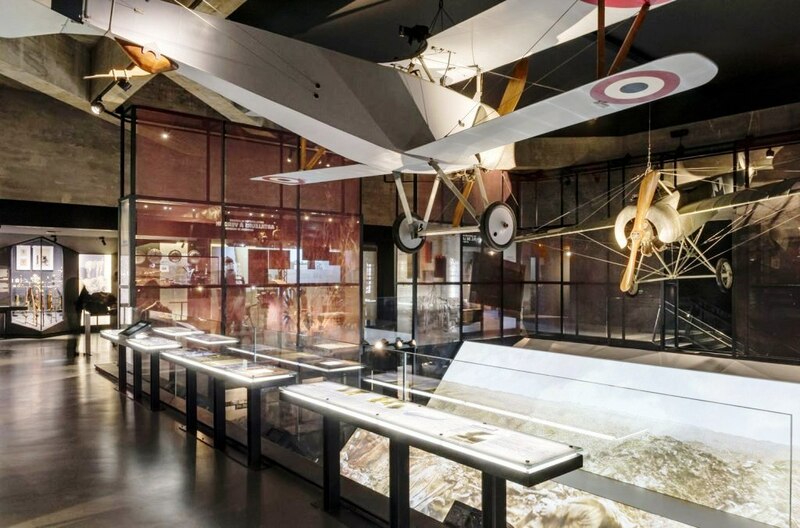 Several of his oil paintings that were used as cover pages for La Guerre Documentée are on display at the museum of the Fort de la Pompelle near Reims. One hundred years ago today, encouraged by their capture of strategically important Fort Vaux on their left flank and their slow but determined advance through the Ravine of Death on their right flank, the Germans reinforced the right bank sector at Verdun and launched a major attack. It was directed against a line defined by Fort Souville, Fleury Village, and the Thiaumont Ouvrage (a substantial field fortification). Anticipating this renewed offensive, French commander, General Robert Nivelle, exhorted his men that morning to hold: Vous ne les laisserrez pas passer! (You shall not let them pass!) was his Order of the Day. 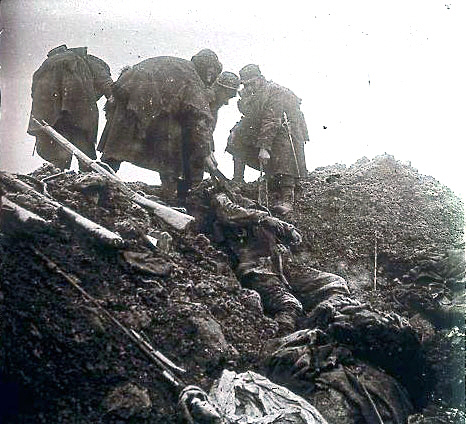 The ensuing two-plus months of fighting would mark the high point of Battle of Verdun. It was concentrated in what is called the Hot Zone, the key features of which are conveniently arrayed in an "H" shape. The H is a little tilted, its top points to the northeast and the bottom toward the southwest, directly to the city of Verdun. The two stems of the letter follow parallel ridges overlooking and dominating a network of ravines. 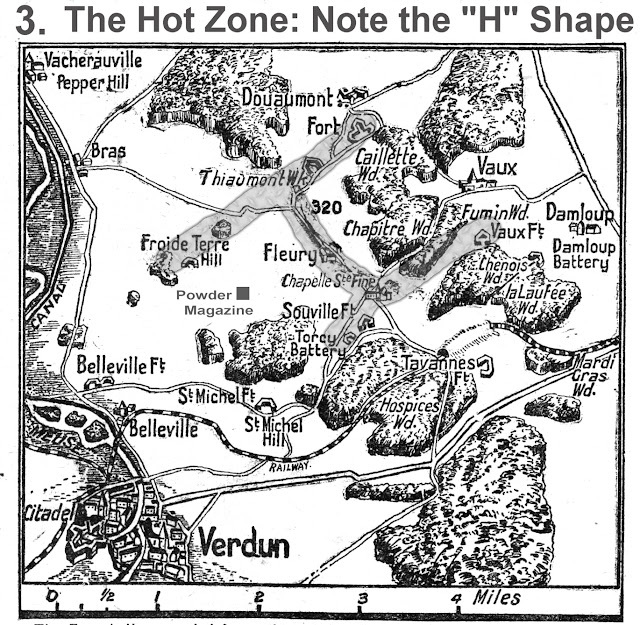 The top stem of the H had three significant defensive positions: Fort Douaumont, which fell on 25 February, Thiaumont Ouvrage, which fell on 23 June, and Froide Terre Ouvrage, which held out for the entire battle. 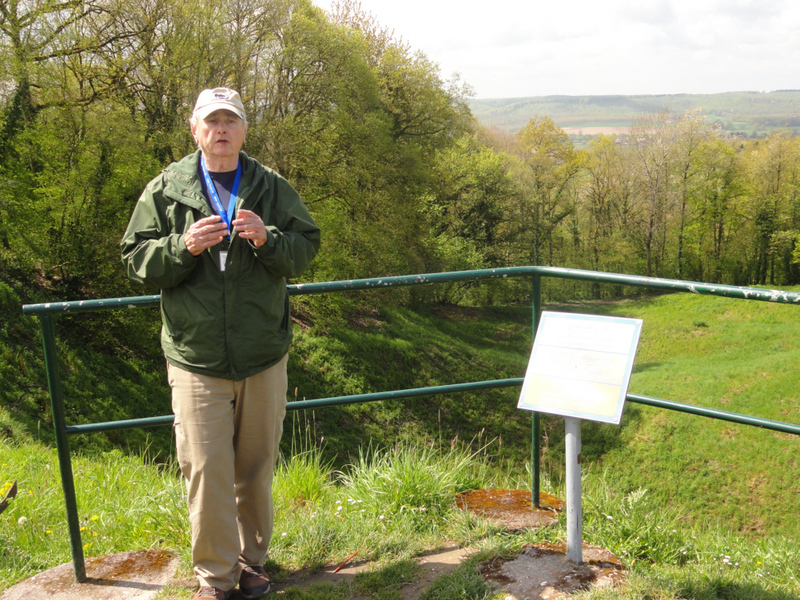 The second major ridge — pointing at the east bank area of city of Verdun holds two of the most strategically important forts on the entire Fortress Zone: Fort Vaux (lost on 7 June), which guarded the French right flank overlooking the German-occupied Woëvre Plain, and Fort Souville, the best observation position on the entire battlefield. The crossbar — connecting Thiacourt and Fort Souville — is a slightly raised road that in 1916 was the location of the village of Fleury, which had a prewar population of 422. In the ravine behind it were two structures, a powder magazine, and small redoubt, which the German assault troops actually reached at least once. A partial view of the Hot Zone from the Ossuary Tower. The distant hill on the horizon is Fort Souville and the gray mass below it is the Memorial Museum. The memorial is adjacent to the destroyed village of Fleury. The dramatic drop-off behind the memorial is the ravine where the powder magazine is located and where some of the fiercest fighting took place. The ridge each side of Souville is one stem of the H, and along it, out of the picture to the left, is Fort Vaux. The ossuary sits on the other ridge. Fort Douaumont is to the photographer's left about a mile, and Thiaumont is immediately to his right, with Froide Terre, two miles farther. Most of the Hot Zone has been reforested, but there are a few untouched sections where you can see how the battlefield looked at the end of 1916. Thiaumont Ouvrage fell on 23 June and despite constant French attempts was not regained until 24 October, as would be Fort Douaumont the same day. After Thiaumont fell, Fleury Village and the Ravine behind it leading to the Powder Magazine would become the focus of activity. Fleury would change hands 16 times during the fighting and would finally be secured in mid-August by Moroccan troops. Fort Souville and Froide Terre would never fall. (More on this in later postings.) On 2 September the new German supreme commander, Paul von Hindenburg, ordered a cessation of offensive operations at Verdun. 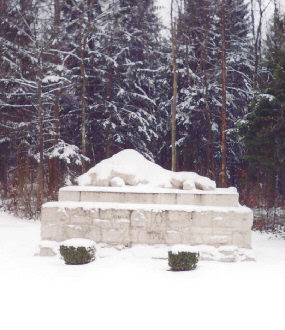 At the junction of the crossbar of the H and the Souville-Fleury leg, sits a German regimental memorial — a wounded lion — symbolic of the farthest advance of the nation's forces at Verdun, which was nearby. The poet/soldier Alan Seeger, born in New York and educated at Harvard University, lived among artists and poets in Greenwich Village, New York, and Paris, France. When the Great War engulfed Europe, and before the United States entered the fighting, Seeger joined the French Foreign Legion. I have a friend, who has been telling me for years that Seeger was a tremendous war correspondent, and I've finally had a chance to read some of his work. Frank, you were right! In the collection of Seeger's letters and diary are included six long letters he sent to the New York Sun. Below are some passages from the first of these, dated 8 December 1914. One commentator describes Seeger's style as His war is intensely impressionistic — vivid, intensely colored, even painterly. There is something fascinating if one is stationed on sentry duty immediately after arrival in watching the dawn slowly illumine one of these new landscapes from a position taken up under cover of darkness. The other section has been relieved and departs, we are given the consigns by the preceding sentinel and are left alone behind a mound of dirt facing the north and the blank, perilous night. Slowly the mystery that it shrouds resolves as the gray light steals over the eastern hills. Like a photograph in the washing its high lights and shadows come gradually forth. The light splash in the foreground becomes a ruined chateau, the gray-streak a demolished village. The details come out on the hillside opposite, where the silent trenches of the enemy are hidden a few hundred meters away. We find ourselves in a woody, mountainous country, with broad horizons and streaks of mist in the valleys. Our position is excellent this time, a high crest, with open land sloping down from the trenches and plenty of barbed wire strung along immediately in front. It would be a hard task to carry such a line, and there is not much danger that the enemy will try. With increasing daylight the sentinel takes a sheltered position and surveys his new environment through little gaps where the mounds have been crenellated and covered with branches. Suddenly he starts as a metallic bang rings out from the woods immediately behind him. It is the unmistakable voice of a French 75 starting the day s artillery duel. By the time the sentinel is relieved, in broad daylight, the cannonade is general all along the line. He surrenders his post to a comrade and crawls down into his bombproof dugout almost reluctantly for the long day of inactive waiting has commenced. . .
After the brilliant French victory in the battle of the Marne, the Germans, defeated in their attack on Paris, fell back to a line about midway between the capital and the frontier and intrenched themselves strongly along the crests well to the north of the River Aisne. 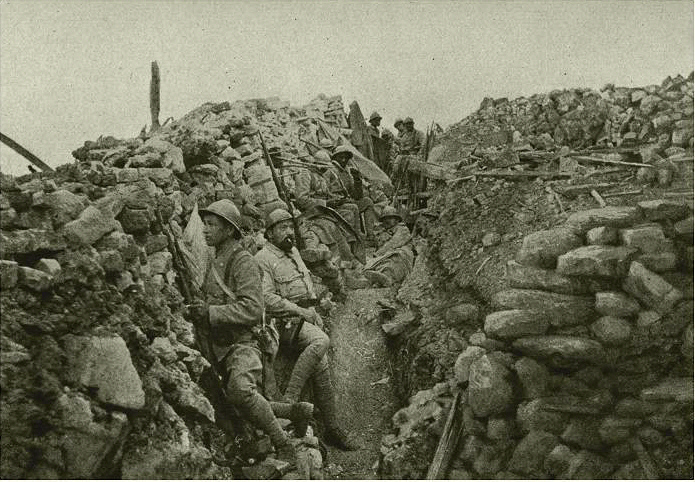 The French, following close on their heels, took up whatever positions they could find or win immediately behind and sat down no less strongly fortified along a line separated from that of the enemy by distances of usually only a few hundred meters. A deadlock ensued here, and the theatre of critical activity shifted to the north, where the issue is still at stake in the tremendous battle for the possession of the seaboard and the base for an enveloping movement which may be decisive. Toward the east the operations have become pretty much confined to the artillery, pending the result of the fighting in the north, which must be decided before an advance can be undertaken by either side on other points of the line. True, occasionally a violent fusillade to the right or left of us shows that attacks are being made and at any moment are likely to be made, but these are only local struggles for position, and in general the infantry on the centre are being utilized only to support the long line of batteries that all along this immense front are harrying each other at short distances across field and forest and vineyard. This style of warfare is extremely modern and for the artillerymen is doubtless very interesting, but for the poor common soldier it is anything but romantic. His role is simply to dig himself a hole in the ground and to keep hidden in it as tightly as possible. Continually under the fire of the opposing batteries, he is yet never allowed to get a glimpse of the enemy. Exposed to all the dangers of war, but with none of its enthusiasms or splendid elan, he is condemned to sit like an animal in its burrow and hear the shells whistle over his head and take their little daily toll from his comrades. . . It is ignoble, this style of warfare, he [a veteran of the Balkan Wars] exclaims. Instead of bringing out all that is noble in a man it brings out only his worse self meanness and greed and ill temper. We are not, in fact, leading the life of men at all, but that of animals, living in holes in the ground and only showing our heads outside to fight and to feed. Though modern warfare does not allow us to think more about fighting than eating, still we do not actually forget that we are on a battle line. Ever over our heads goes on the precise and scientific struggle of the artillery. Packed elbow to elbow in these obscure galleries one might be content to squat all day long, auditor of the magnificent orchestra of battle, were it not that one becomes so soon habituated to it that it is no longer magnificent. We hear the voices of cannon of all calibres and at all distances. We learn to read the score and distinguish the instruments. Near us are field batteries; far away are siege guns. Over all there is the unmistakable, sharp, metallic twang of the French 75, the whistle of its shell and the lesser report of its explosion. When the German batteries answer the whistle and explosion outdistance the voice of the cannon. When one hears the sifflement [whistling] the danger has already passed. 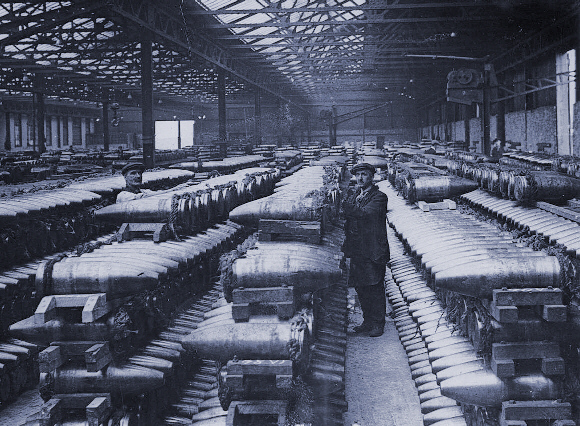 The shells which burst immediately overhead and rattle on the roof of our bombproof dugout come unheralded. Sometimes they come singly, sometimes in rapid salvos of two or three or four. Shrapnel's explosive report is followed by the whiz of the flying balls. Contact shells or marmites explode more impressively, so that the earth trembles. Shrapnel shatters trees and snaps good sized trunks as if they were twigs; contact shells dig holes eight or ten feet across all over fields. . . It is toward evening that the cannonade is always fiercest. With darkness it almost completely subsides. Then the sleepy soldiers, cramped and dishevelled, crawl out of their holes, rouse themselves, stretch their legs and take the air. Everybody turns out like factory workmen at 5 o clock. The kitchen squad departs, others set to work repairing smashed defensive earthworks and the night s first sentinels go on. Sentry duty, which may be all that is melancholy if the night is bad and the winter wind moans through the pines, may bring moments of exaltation if the cloud banks roll back, if the moonlight breaks over the windless hills or the heavens blaze with the beauty of the northern stars. It has been so for the last few nights, since I commenced these notes. A cold wave has frozen all the bad ways; a light snow has fallen and at night the moonlight flooding out of a frosty sky illumines all the wide landscape to its utmost horizons. In the hollow the white shell and chimneys of the ruined chateau stand out among the black pine groves; on the crest opposite one can trace clear as in daylight the groves and walls and roadways among which wind the silent and uncertain lines of the enemy's trenches. Standing facing them from his ramparts the sentinel has ample time for reflection. Alone under the stars, war in its cosmic rather than its moral aspect reveals itself to him. Regarded from this more abstract plane the question of right and wrong disappears. Peoples war because strife is the law of nature and force the ultimate arbitrament among humanity no less than in the rest of the universe. He is on the side he is fighting for, not in the last analysis from ethical motives at all, but because destiny has set him in such a constellation. The sense of his responsibility is strong upon him. Playing a part in the life of nations he is taking part in the largest movement his planet allows him. Seeger would serve another 19 months in the trenches before he met his "Rendezvous with Death" on 4 July 1916 during the Battle of the Somme. Letters and Diary of Alan Seeger (New York: Scribner’s, 1917) is available online at no charge. Eric Bogosian is not an historian or a journalist, the two callings that specialize in creating historical narratives, fact-checked and peer-reviewed. Bogosian is a playwright, director, and actor best known for his work on the New York stage and TV's "Law and Order" franchises, so he does know a thing or two about how to tell a compelling story. More important for this book, however, is the fact that he is Armenian,and that he found something new to relate. 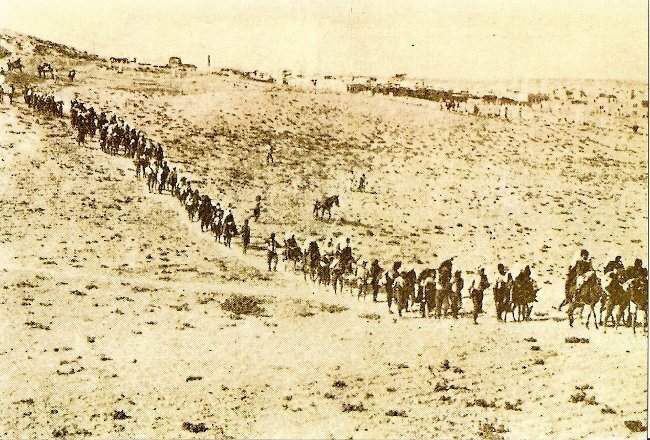 Even America-born Armenian descendants continue to live in the shadow of the calculated destruction of their families that began in 1915 at the hands of their Turkish rulers, and, as anyone who has ever created a related search algorithm on Amazon.com knows, there are hundreds of books about the Armenian Genocide in print. The latest narratives have the advantage of archival and government materials that have become available only in recent decades that substantiate personal memories. A few Turkish scholars have also weighed in on the side of truth-telling, a serious risk for them under Turkish law. 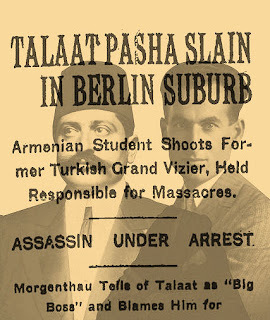 When Bogosian stumbled upon this little-known story about genocide survivors who organized to take revenge on the Turks, he recognized a tale that needed to be told. We have known through books and documentaries about the Jewish agents and lone wolves who sought out Nazi perpetrators after the Holocaust for retribution, but I, for one, had never heard the story of Armenian payback. Bogosian did his due diligence in amassing facts, checking sources, and asking advice of professionals to make sure his work would meet academic standards, and his concentrated course in historiography paid off with this engrossing and profound narrative. To inform the general reader, the first chapters synopsize the history of the Armenians and their relationship with the Ottoman Empire, and tells the story of how the Young Turk government used the excuse of the Great War to realize their program of eliminating Armenians from within their borders. The information is a bit thick and much more like a standard history book, but the author sets the stage well. The rest of the book reads like the best kind of crime drama. Rather than repeat all the horrors of systematic massacres, Bogosian concentrates on the stories of the men who survived their own harrowing experiences, so the reader directly connects to the victims. The author uses all the memoirs, letters, and related conversations he could find to provide vivid character studies of the Nemesis agents. When these men realize that the administrative perpetrators of these crimes were not going to be adequately punished, we understand their motivation for revenge. The author takes us to many countries and through many tense moments as the avengers plot and carry out their plan to gain satisfaction, all in the deepest secrecy and requiring personal sacrifice. I'm giving a talk at the Sacramento Public Library this Sunday, 26 June 2016, on the Battle of the Somme. (You are all invited, by the way. It's at 3 p.m. at the Central Library.) Most likely, almost none of the attendees would have visited the battlefield, and so I have had to come up with a way to show its particular physical characteristics. The geography of the Somme greatly influenced why the battle unfolded as it did. I've created the slide below help make this point. The two images (lifted off of Google Maps) are from the center of the British sector, and very close to two of the most famous locations of the battlefield. In both we are looking in roughly the same direction down what is known as Caterpillar Valley. 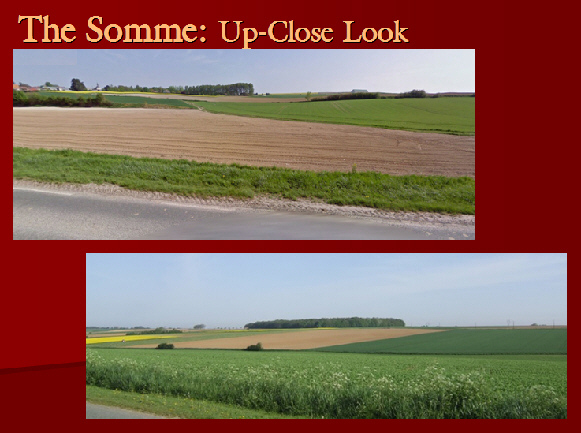 Both show the rolling open feel of the Somme and the relative advantage given locally by the area's minimally high ridges and spurs. The top image shows a sector significant on 1 July 1916. 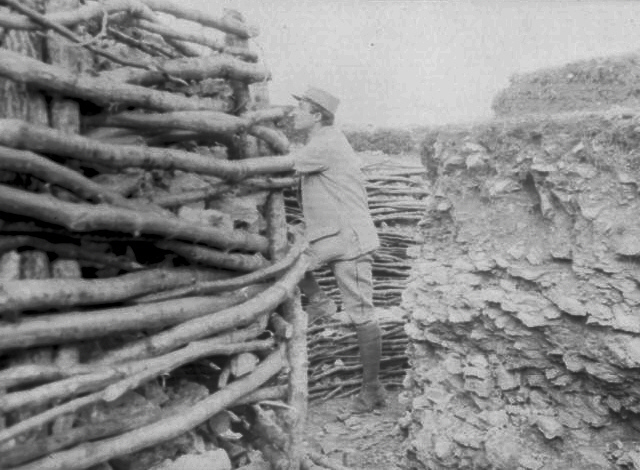 Just behind the camera is located legendary Devonshire Trench. The front line crosses the road in a near-perpendicular fashion just off to the left of the image. The village visible to the left is Fricourt, which had been held by the German Army since October 1914, and was highly fortified in the ensuing two years. 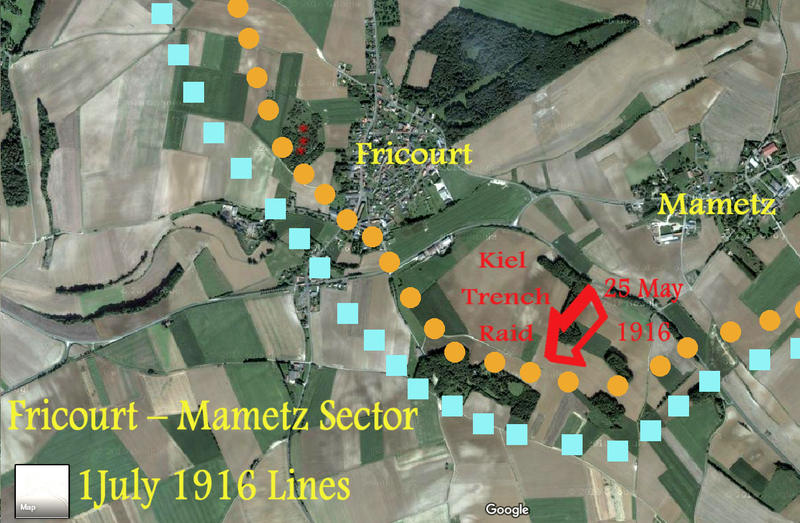 The Germans had also dug their trenches around Fricourt, running up to the rise just in front of the road. Consequently, the men of the Devonshire regiment, as they left their trench, were exposed both to flanking machine gun fire from Fricout on their left and the high ground just ahead. Many of them were mowed down so quickly that afterward their bodies were simply carried back to their starting trench and buried there. 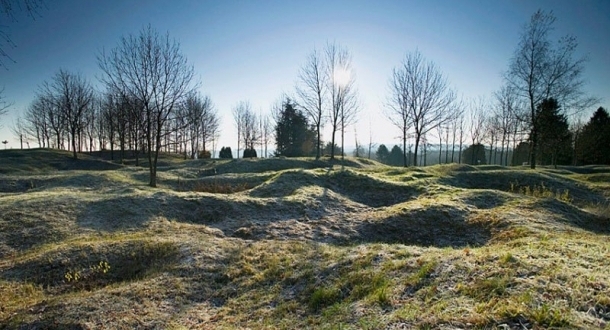 That cemetery is one of the great pilgrimage sites of the Somme battlefield today. A sign there states: "The Devonshires Held This Trench – The Devonshires Hold It Still. In the distance, beyond and just to the right of Fricout are visible the treetops of Mametz Wood, and, further right in the far distance, about five miles away, can be seen High Wood. These are two of the five forests clustered around Caterpillar Valley that would be major obstacles for the British and bastions for the Germans in the later battle. More on them below. The lower image is a closer view of High Wood. Highly valued by the Germans it would be the site of ferocious fighting for two months. It is said that over 8,000 men of both armies still lie in High Wood today. Each of these five woods around Caterpillar Valley has a similar tale to tell. The next one over, Delville (i.e. Devil) Wood, when eventually captured by the South African Brigade, had but a single tree left standing after the fighting died down. The German Army occupied almost all the best positions in the area when they arrived in 1914 and spent the next two years fortifying the zone. The Allies selected the area for their 1916 offensive because it seemed to present the best opportunity to rupture the enemy lines and break through to the rear. However, rolling – as opposed to flat –country gives a determined defender many advantageous positions to watch and fire on an advancing force. On the other hand, the story of the woods gives some insight as to how the Germans nevertheless incredibly managed to match and at times exceed the Allies' casualties for the rest of the battle. They met any partly successful enemy advance with an all-out counterattack. In the woods, with the lack of visibility, any attack was subject to getting chewed up by hidden machine guns, no matter the tactics or the skills of the attackers. 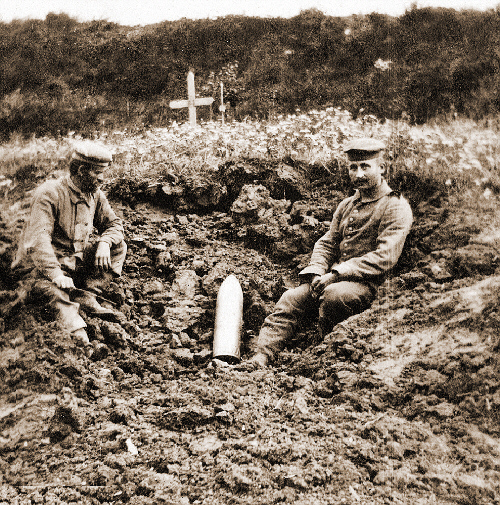 Why was the Somme the bloodiest battle of the war on the Western Front? Because it was the wrong place to fight a major battle given the operational capacities of the armies in 1916. Dalton Hayes (1898–1950), grandson of President Rutherford B. Hayes, was a freshman at Princeton University when the U.S. entered World War I in April 1917. He joined the Princeton Battalion, headed by Captain Stuart Heintzelman, U.S. Army. Later, he trained with the Princeton Officer Training Corps. 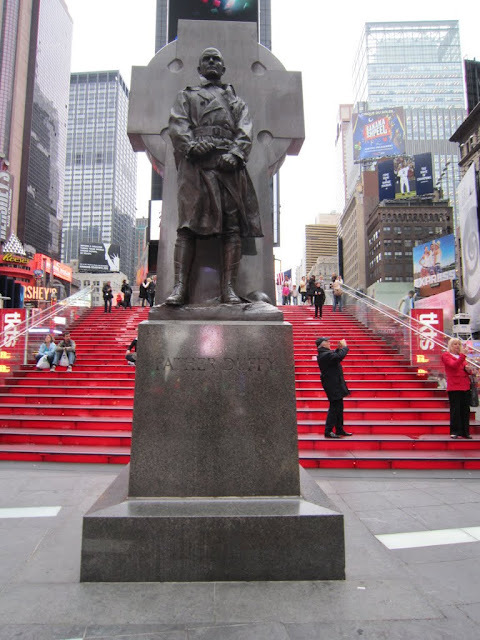 On 10 September 1917 he enlisted at Camp Mills, Long Island, in the 69th New York Regiment of the 42nd Rainbow Division in Co. D 165th Infantry. He served in the A.E.F. in all engagements participated in by his company, until he was seriously wounded on 14 October 1918. I’m afraid it’s a terribly long time since I’ve written but it was not my fault.Since my last letter my division & regiment have helped considerably in stopping the big German drive and then pulled off the push you must have read about, in a different sector.We had over a month straight on the lines.When we were in trenches we all prayed for open fighting – but take me back to the trenches! The “doc” had beaucoup work under fire. We [suffered] quite a little from [hunger] as we advanced so rapidly that the [kitchens] couldn’t catch us for four or five days! We ate our own iron rations & those of the dead Boches (of whom there were quite some) and so didn’t exactly starve.The poor German soldiers don’t get much to eat but the officers live on the fat of the land. The German shreklichhiet hasn’t changed any since 1914. They bombed & shelled hospitals wore red crosses on their arms, used explosive machine gun bullets etc ad infinitum.One particular example – our platoon captured a m.g. implacement with twelve men: they all hopped out shrieking Kamarad with Red Cross bands on their arms and potato-mashers (hand grenades) in their pockets.They got Kamaraded all right! At that we took quite a few prisoners-the first two days. All the prisoners predicted that the war would end this winter or this coming spring. Garn (an officer too) even went so far as to say he’d be willing to pay for every shell fired by the Boche after Oct 15!! I’m not so hopeful of it’s being over so soon however. After we came out I was so very fortunate as to get a pass to Paris for two blissful days. I surely had a wonderful time but to my disappointment found that Uncle Webb was in Barcelona Spain. Had an air-raid while we were there, but I didn’t hear a sound of it. They said there was a little damage done in the Paris region I wrote a postcard to nearly everyone I know. Following World War I, he resumed his studies and graduated from Princeton. In 1921 he was employed by the Atlantic Refining Company. 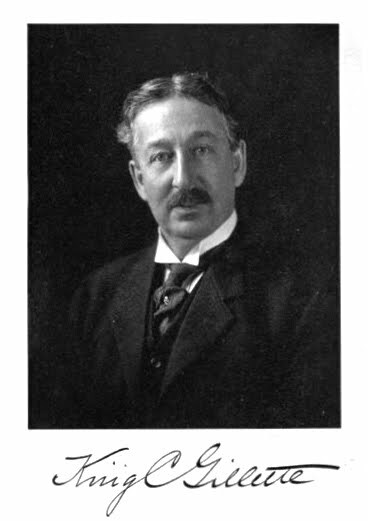 He later became associated with the Standard Oil Company of New Jersey in its foreign branch and spent considerable time in Australia, South Africa, Cuba, and Bermuda. On April 17, 1926 he married Corinne Monsarrat in Columbus, Ohio. They had two daughters, Chloe and Jean. On the outbreak of World War II Dalton returned to military duty as captain, later major, and served in intelligence. He was active in Portuguese East Africa. He was instrumental in locating a radio station from which German agents directed the destruction of Allied ships by German subs. After service in Portuguese East Africa, he was assistant military attache at Pretoria, South Africa, and then Melbourne, Australia. After World War II, Mr. Hayes resumed his association with the Standard Oil Company (New Jersey) at its New York office and remained there until 1 August 1948 when ill health forced him to retire. The Hayeses maintained a summer home at Bryant Pond, Maine. Dalton Hayes died in 1950 and is buried in Oakwood Cemetery, Fremont, Ohio. By mid-1916, major fighting had spread on the Italian Front from the Isonzo River basin to the Trentino and Asiago Plateau. Italy had lost far more men and spent much more of its national treasure than it had ever expected when it entered the war on the side of the Allies a year earlier in anticipation of their early triumph. I thought this would be a good time to look back on just how the young kingdom of Italy found itself embroiled in the war to end all wars, only to find itself disappointed at the postwar peace conference. In February 1915 the Italians entered into secret negotiations with the Entente about repudiating their membership in the Triple Alliance with Imperial Germany and Austria-Hungary. They sought to join the Entente in their war against Germany and Austria-Hungary, provided that the Entente promise Italy receive Austrian lands in the peace settlement. The Russian successes in Austrian Galicia in March, especially the Russian 22 March 1915 capture of the Austrian fortress of Przemsyl convinced the Italian prime minister, Antonio Salandra, that the war against Austria would quickly be over, and he wanted to be with the victors at the coming peace conference. In much the same way as Cavour had insinuated Sardinian troops into the Franco-British coalition during the Crimean War, [fully supported by the king] Salandra instructed his negotiators to accept almost any reasonable offers of Austrian territory. On 26 April Italy entered into the secret Treaty of London with the three Entente powers of the United Kingdom, France, and Russia. 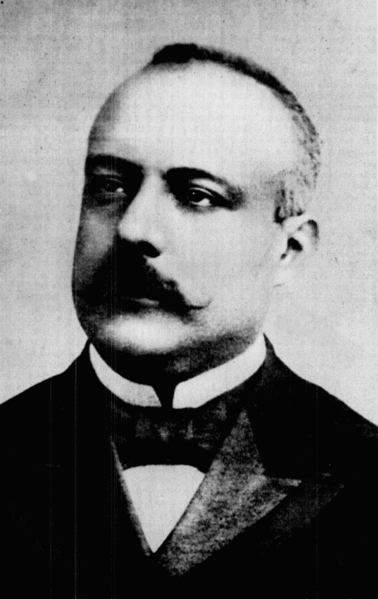 The treaty obligated the young Italian kingdom to declare war on her former allies in the Triple Alliance, Imperial Germany and Austria-Hungary, within a month. The lntente promised that Italy could have the southern portion of the Austrian crown Land of Tyrol, the Austrian Adriatic littoral, including the city of Trieste, a large portions of Dalmatia and Carinthia, and several, although not all, of the Adriatic islands. The secrecy with which the treaty had been negotiated violated the first of his Fourteen Points, which promised open covenants openly decided, so Woodrow Wilson vigorously resisted Italian claims at the Versailles Peace Conference, causing the Italian prime minister, Vittorio Emanuele Orlando, to leave the conference in disgust. Although Italy didn't declare war on Germany until 27 August 1916, almost a year and a half after her obligation of a month after the April signing of the treaty, she dutifully went to war with Austria-Hungary, a traditional enemy, on 23 May 1915. 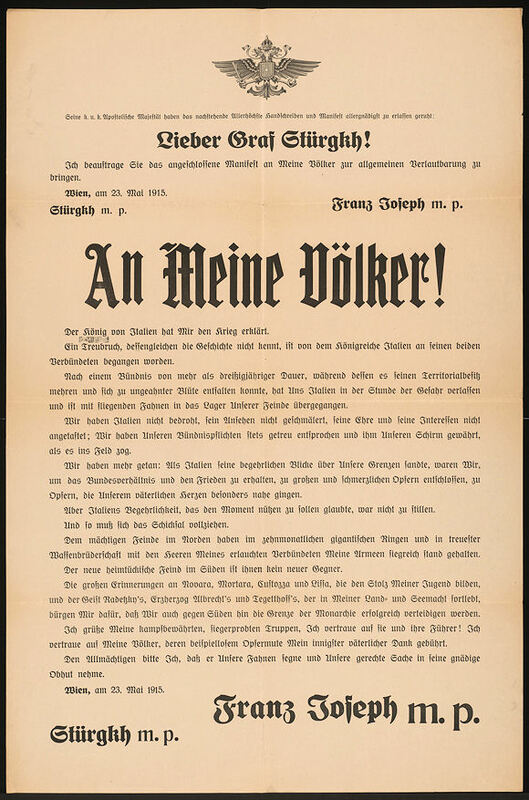 This caused Franz Joseph to issue his famous proclamation (above) of 26 May 1915 in which he claimed that the "King of Italy has declared war on me," a medieval concept in this very modern war. But Franz Joseph was able to turn his tired eyes away from the unfamiliar maps of the East and to the familiar, from the Italian wars of unification of 1848 and 1866, Italian terrain. Richard Burdon Haldane (1856–1928) was a brilliant Scottish lawyer, philosopher, and politician who led the reform of the Britain's pre-WWI army. His work made the deployment of the 1914 British Expeditionary Force feasible. He is best remembered, though, for the disappointing Haldane Mission, a diplomatic visit to Berlin he undertook as British secretary of state for war. During the mission, which lasted from 8 to 11 February 1912, British ruling circles sought to explore possibilities for a British-German agreement that would recognize British naval superiority. If Germany would cease to compete with Britain in building up naval armaments, the British government was prepared to satisfy some of Germany's colonial demands in Africa. The Germans sought to conclude a separate British-German agreement pledging each side to neutrality should the other find itself involved in a war; such an agreement would have amounted to Great Britain's withdrawal from the Entente. No agreement was reached, however. Lord Haldane's negotiations with the German imperial chancellor, Theobold von Bethmann-Hollweg, underlined the profound differences between Great Britain and Germany and actually led to an intensification of their naval rivalry. After his service as war minister, Haldane became Lord Chancellor but was hounded out of office by the press unjustly for supposed German sympathies. In the 1920s he moved to the Labor Party and returned to office as Lord Chancellor in the cabinet of Ramsay MacDonald. He is remembered for drafting the legislation making London University possible. A Cold War Euphemism for These Was "Expendables"
I found this interesting table below in a 2002 paper titled "THE ECONOMICS OF WORLD WAR I: AN OVERVIEW" by Stephen Broadberry and Mark Harrison of University of Warwick, Coventry. 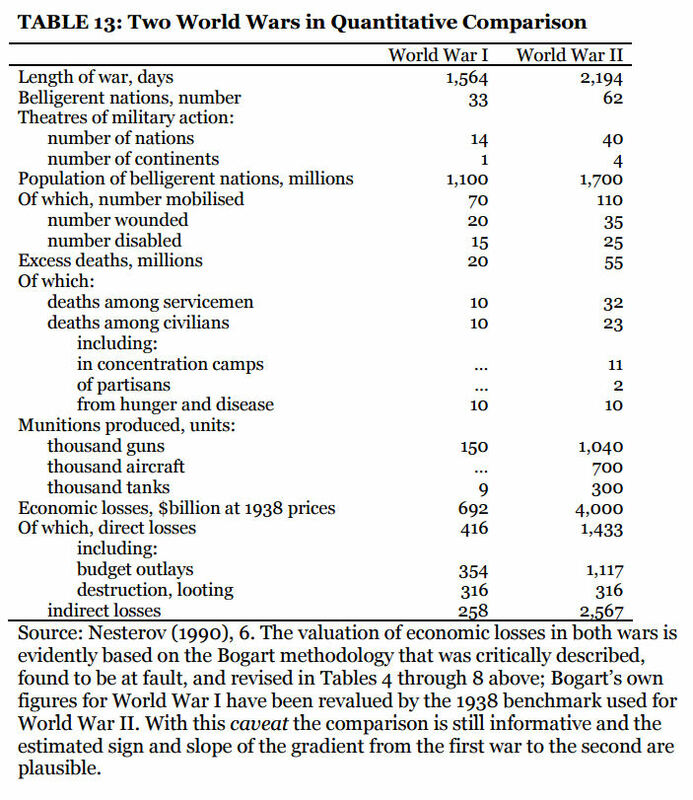 I can't vouch for the precision of the statistics (I think they made a mistake on the number of continents for WWI), but it does show in broad scope some of the similarities and differences in the two world wars. Remember the Titanic's Rescue Ship RMS Carpathia?